OnTrack Network is a company that provides targeted advertising to horse racing fans through race tracks, casinos, and bars. They requested trade show materials to promote their services to potential clients. We used the dramatic imagery of horse racing to tie-in the excitement and action of the sports venue to potential advertisers. The brochure structure was an accordion-fold and opened to reveal the benefi¬ts and specifications for the specialized advertising company. 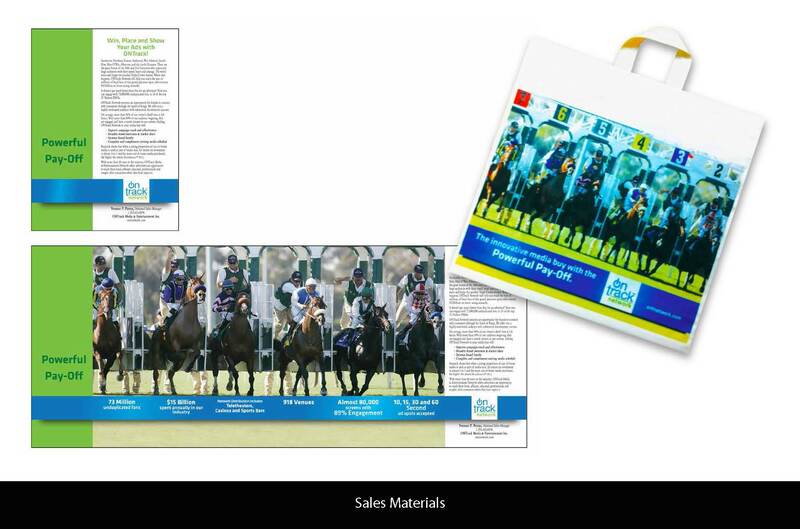 Since the content was meant for trade shows, we also included a branded bag to carry the advertising materials. The client’s materials were well-received and there were several leads for ONTrack to pursue and turn into advertisers.